We've gone through a variety of timeline formats in the history of our homeschool. We started with a wall timeline chart with pictorial images, but it was unwieldy and awkward and was always falling off the wall. So that turned out to be a fail. 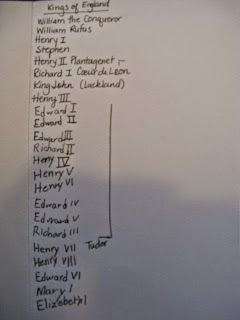 Then we tried a binder timeline with pictorial images, which was better. However, by the end of that school year, it had pretty well fizzled too – in part because the binder was clunky and so I often *forgot* (ahem) to pull it out. 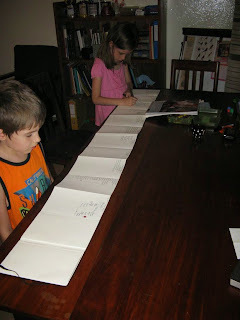 The printing of images was also too dependent on me and wasn't allowing Michelle to form enough of her own connections, which is a big part of the value of keeping some kind of a timeline. So we dropped that idea too. 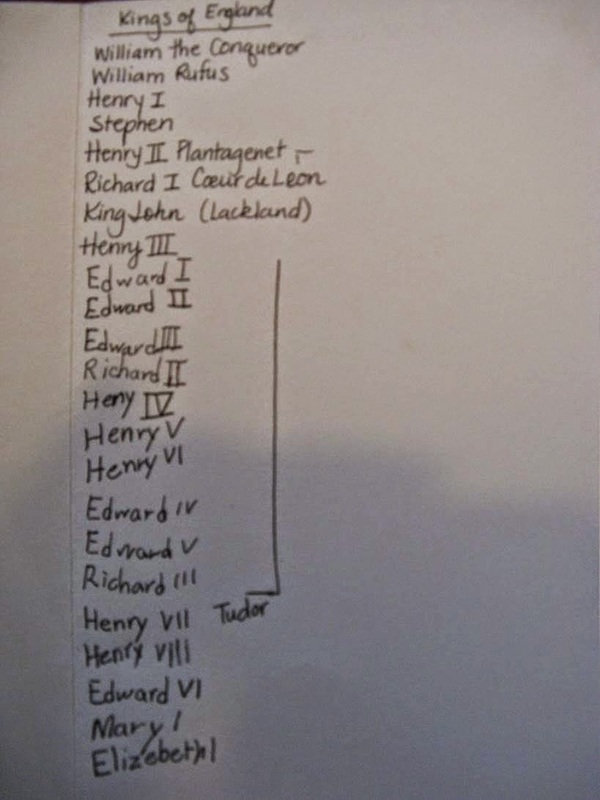 Last summer, we started a Stream of History Chart as described in The Living Page, and that is still working well for us. In the post in which I described that chart, I mentioned that I was toying with different ideas to replace the binder timeline. Today, I wanted to share what we ended up with because I have been quite pleased with how it has worked out for us. It was inspired by an idea shared by another lady over on the Ambleside Online forum. This is our take on that idea. I started with one of these Moleskine notebooks. The pages pull out accordion fold style but close back up into a slim little book that is easy to store and easy to grab when we want to add something. Because I now have two official students and therefore two identical timeline books floating around my house, I printed their initials in a fancy font onto sticker paper to stick onto the front covers to easily tell them apart. The idea is along the same lines as Miss Mason describes herself here in Volume 1, just in a little book that can be folded away rather than a large sheet of paper or wall chart. Each page is one century. 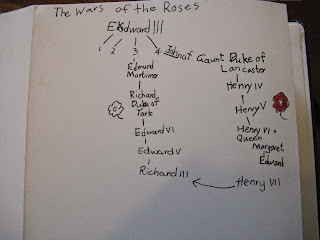 I started with the present century in the front of the book and worked backwards through the centuries AD. The flip side of the pages work back through the centuries BC. When we come across something we want to enter, we very simply add that name or event into its correct century. 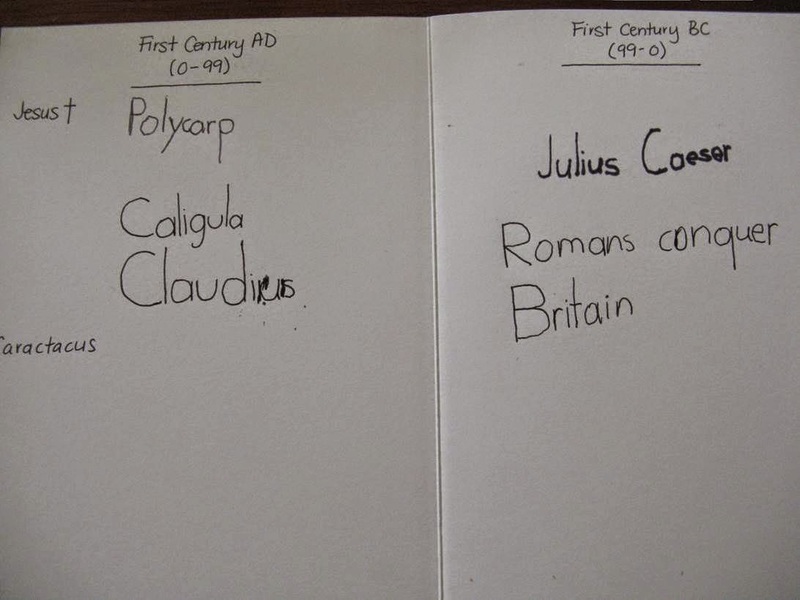 With my Year 1 student, we do this together directly after reading – I'll ask him at the end of a historical reading if there is anything he wants to add, and then I help him find the correct century and add it. On Fridays, I ask my Year 3 student to think of 2-3 people or events that she has read about that week that she would like to add. I am starting to teach her how to look up the dates online when they aren't mentioned in the book we are reading so she can add them for herself. This term's history (Year 3, Term 1) has focused in heavily on the 1500's. 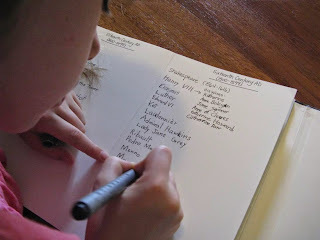 You can see the list of names she has collected here. For the centuries BC, I only went back to 2000BC, and then added one more page titled 'dates before 2000BC'. This left about three blank pages left at the end of the book. James, my Year 1 student, hasn't used these pages yet. 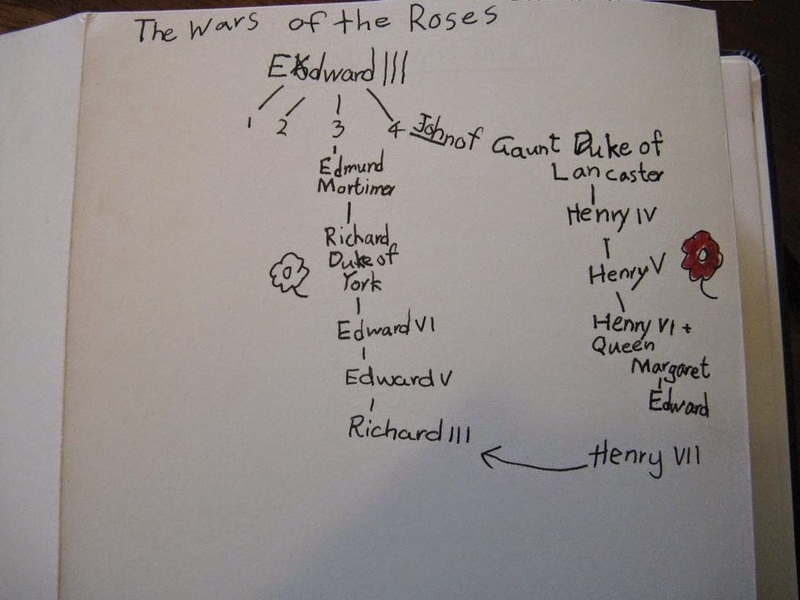 Michelle (Year 3) is keeping a running list of all the Kings and Queens of England that we have read about in Our Island Story on one of the pages, and chose to copy the family tree chart we made to help us understand the Wars of the Roses onto another page. We'll see what else we come up with to do with these pages as time goes on. My plan is to continue keeping these books through our first history rotation – which in AO goes through the first term of Year 6. 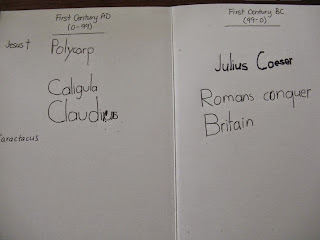 When they start back at the ancients again in the second term of Year 6, I will have them start keeping a 'real' Book of Centuries (like Jeanne describes here). I hope to purchase a Book Of Centuries while we are in the States this coming year so I can start keeping one for myself. 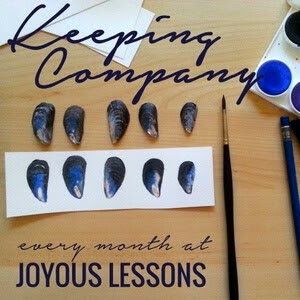 I find the best way to train my children in 'keeping' habits is to 'keep' right along with them. Your post was so helpful in seeing how you put this into practice! Thanks so much for sharing! I love this and I'm looking forward to trying it next year when my dd7 starts Year 2 and my dd6 starts Year 1! I also fizzled out with pictorial entries, so hopefully the short written notes will help. 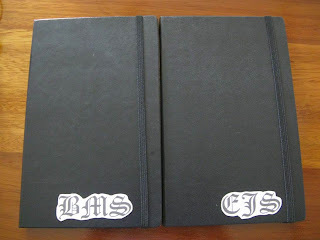 I love the journal that you found to do it in. I'm sure my kids will love the accordion style. I love this idea! Did you stop using the streamline of history chart? In this post, you say it is still working for you. So I wonder, would you suggest the streamline of history chart for a few years and then move to this accordion style in year 3 or something? And then BOC in yr 6? I'm just trying to figure things out with my year 1. Thanks for all the suggestions!! !